: 305 р. 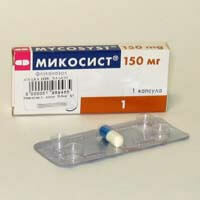 Average price online (1 capsule 150mg) * : 305 p.
Gelatin capsules, filled with powder or powder mass. The main active ingredient, fluconazole - antifungal drug, a group of triazoles. Effective against most fungal pathogens, including candidiasis (thrush). The therapeutic effect is a violation of the synthesis of ergosterol and the cessation of growth of the cell wall of fungi. Excipients: silicon dioxide, magnesium stearate, talc, povidone, corn starch, lactose. After taking the tablets, fluconazole is absorbed into the blood by 90%. 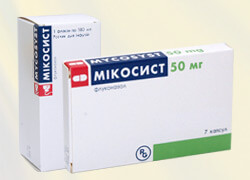 The maximum concentration after administration of 150 mg is reached in 0.5-1.5 hours. It penetrates all tissues and body fluids. In the stratum corneum of the epidermis, dermis and sweat fluid, high concentrations are reached that exceed the serum levels. Constant values ​​in the vaginal secretion are achieved 8 hours after ingestion and are held at this value for at least 24 hours. 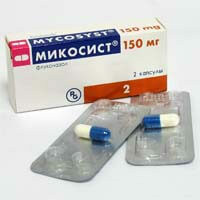 Mycoses when taking cytostatics, in patients after transplantation, the use of antibiotics, with immunodeficiency. Cryptococcal infections 400 mg once a day on the first day, then 200-400 mg / day Determined by a doctor, examination is necessary. Usually 6-8 weeks. Severe systemic candidiasis may increase the dose to 800 mg / day At least 2 weeks after the disappearance of symptoms or negative tests. For children, fluconazole is possible, but only the doctor determines the dosage and duration! See Which doctor treats the fungus? Simultaneous medication that causes arrhythmia. The drug is not combined with terfenadine and cisapride in a dose of more than 400 mg / day. In this case, the risk of serious heart rhythm disorders increases. 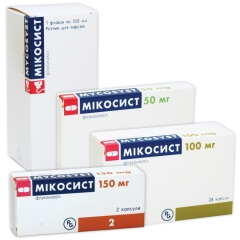 It is dangerous combination with midazolam, because this leads to a significant increase in the concentration of midazolam in the blood and the risk of developing psychomotor reactions. 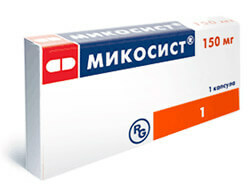 In case of overdose, gastric lavage and ambulance treatment is necessary. Symptoms - nausea, vomiting, diarrhea; in severe cases, there may be hallucinations, paranoid behavior, convulsions. Capsules are available without a prescription. Premature discontinuation of treatment leads to relapse. Keep must be out of the reach of children, at a temperature of 10-25 degrees. Shelf life 5 years. Production date or shelf life is indicated on the packaging.